Raspberry Pi enthusiasts looking for a way to harness the rays from the sun to power their pocket size Raspberry Pi Zero mini PC, which are now available to purchase priced at just $5. Maybe interested in a new piece of hardware in the form of the Solar Pi Platter which has been created by Mike Seiler from Rocket Blue Automation and this week launched via Kickstarter. Check out the promotional video below to learn more about the Solar Pi Platter and how it can be used to harness the sun to power your Raspberry Pi Zero. Solar Pi Platter – A versatile board that provides the missing expansion ports for your Pi Zero and lets you run it anywhere. Look at the Pi Zero. It’s small, really cheap and sips power. Seems like it’s made to wander around, measure weather in the back woods and provide a slice of computing anywhere there’s some sun. But it can’t do any of this without added circuit magic. That’s Why You Need a Pi Platter – The Pi Platter fits UNDER your Pi Zero to provide the functions you need for UPS (Uninterruptible Power Supply), portable and solar power projects. This means the Pi Platter leaves the GPIO expansion header completely available for you to use on your project. – Smart UPS (Uninterruptible Power Supply) allows you to power your project directly from an attached USB charger and automatically switch over to the battery if the power fails. The Pi Platter makes sure the battery is charged and warns the Pi of low battery so it can shutdown properly. 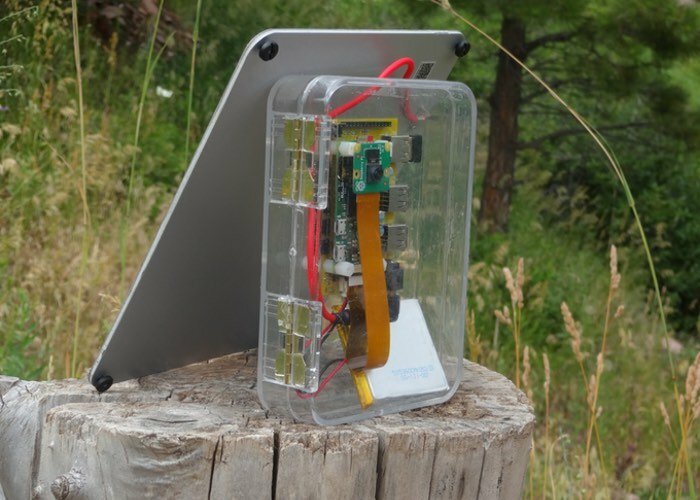 – Optimized Solar Charger so you can power your Pi from the Sun for remote applications. Special features allow you to shutdown the Pi when the power is low and the automatically restart the Pi again when the battery is charged. – Supports a wide range of LiPo batteries to match your specific needs. – Real Time Clock with repeating alarm keeps track of time when the Pi is off and schedule times to start the Pi (great for remote time lapse photography). – Header that matches a Sparkfun break-out board for adding a direct Ethernet port. 3 High Speed USB ports with multiple queues allow different speed devices to operate simultaneously. Much faster than other Pi Zero USB boards that force all USB devices to operate as fast as the slowest device. Two of the USB ports are power-switched so you can optimize power consumption in your application. – Low Power micro controller interfaces your application to the Pi Platter through a simple USB serial port so it does not tie up any GPIO pins. You still have all the GPIO pins available. – 2 x 10 bit Analog Inputs let you interface to the real world. – 2 x 8 PWM Outputs, that can also be configured to drive standard RC servo motors, let you control motors, LEDs and real world devices. – Store board configuration even when power is off to let you power up without error. The Solar Pi Platter has this week launched via Kickstarter looking to raise just $4,350 over the next 30 days and is available to back with pledges starting from just $39 for super early bird backers. So don’t delay jump over to the Kickstarter website via the link below. If you enjoy building Pi projects you might be interested in our comprehensive list of Raspberry Pi displays, HATS and small screens.